Lots of folks have already bought their tickets to join TheOneRing.net and fellow Ringers at our annual party in Manhattan! We’re hard at work planning a special event, and can’t wait to see everyone there. Everyone attending will receive a goody bag, and in addition to this, as ever, we will have some amazing prizes to be won; and we just got news of a very exciting giveaway to include in that raffle. 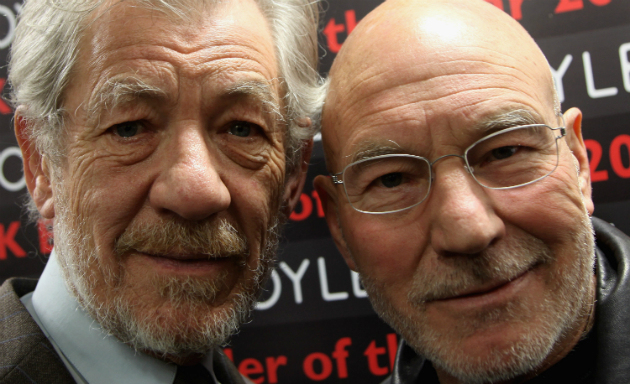 We will be giving away TWO TICKETS to see Sir Ian McKellen and Sir Patrick Stewart on Broadway! The lucky winner (and companion of their choice!) will be able to pick a date to go along and see Gandalf and Picard, (or Magneto and Professor X), live on stage! There will be more amazing giveaways at the party – stay tuned for further details! Your ticket to the party – at The Oak Cellar, Manhattan, on Thursday 10th October – includes two entries into the raffle, as well as your goody bag, your first drink, plentiful finger food throughout the evening, and of course a great time with fellow fans! Numbers are strictly limited in our private room this year, so buy your ticket now! We look forward to seeing you in New York in a couple of weeks.